Today’s “Why This Book Should Win” fiction entry is from Rachel Cordasco, former BTBA judge, and curator of Speculative Fiction in Translation. In Radiant Terminus, we have a novel that disturbs and enthralls, sucking us in to a nightmarish void of a world that might be Purgatory or the Buddhist “Bardo” or some dystopian point in the near/far future. Needless to say, in this moment when the “Second Soviet Union” has fallen and nearly all mammalian life on Earth has died, one wonders if such a distinction even matters anymore. Antoine Volodine, author of “post-exotic” works, has created a cast of characters who move across this wrecked yet lush landscape, seeking some sort of (radiant?) terminus where they can finally find shelter and rest. They converge on a small commune that is slyly named “Radiant Terminus,” run by a man named Solovyei, who spins and declaims his own epic narrative prose poems that tell of his malicious capacity to bring people back—but only partly—from the dead. And then there are people like the Gramma Udgul (and Solovyei himself? ), whose exposure to high levels of radiation have rendered them, in some sense, immortal.The title itself suggests a terminal that emits radiation (e.g., energy unleashed by nuclear reaction)—thus an end point that is always in flux. The time did come when those who had the talent declaimed epic chants, invented poetic or comedic monologues, or recited propaganda texts that had stuck with them in their earlier life, or parts of communist, post-exotic, or feminist romances. The audience accompanied them by approving or voicing speeches, as we did in the old days during Korean pansori performances, when Korea still existed and we still believed in beauty, the future, and the impossibility of death. 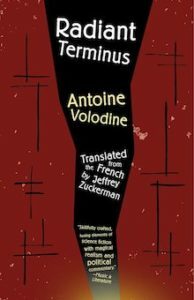 Volodine’s deft manipulation of irony and careful weaving together of narrative perspectives and voices, all stage-managed, perhaps, by Solovyei, makes Radiant Terminus worthy of the BTBA prize. By the end of the book, you’ll feel like you’ve wandered across the bewildering landscape of Volodine’s own mind, and how many authors have you read who can do that? Exactly.